Ever since the Egyptians (Mayans? Indians?) invented zero, curmudgeons have argued that technology creates as many problems as it solves, but I've never encountered a product that does exactly that, until now. I'm talking about a litter box. We all know there are plenty of products that cause more problems than they solve. As a professional technologian, my job is to sift through innovations to see which ones make for an improved life, and which ones are too troublesome for their own good. CatGenie—pardon the pun—gives me pause. After spending a month with it, I declare that it is the perfect zero-sum innovation. Every single advancement comes with drawbacks. While my wife and I no longer suffer from any of the problems associated with a traditional litter box, we are beset with an abundance of unanticipated others. CatGenie is one of these SkyMall-type gadgets that bills itself as the "World's Only Self-Flushing, Self-Washing Cat Box," tossing in, for good measure, a weighty promise: "Never touch, smell, or buy cat litter again." You install it easily by splicing the cold water line from underneath your toilet, running a waste tube up around the lip of the same toilet, and plugging the contraption into the wall. You pour in beads that resemble litter enough that cats get the idea, and you click in a replaceable cartridge of cleaning agent. When the automatic cleaning cycle is engaged, a mechanical scooper removes the poo, and detergent-infused water floods the box and then drains, taking any trace of funk with it. The moistened beads are then blown dry, like Ron Burgundy's hair, as a sweet floral scent fills the bathroom and any adjacent living quarters. The crap in the toilet is easily flushed away, as long as you remember to do it. Compared to the alternative of sifting out chunks from a litter box and tying them off in environmentally uncool plastic bags, this is a beautiful promise. Because of the automatic setup, there's no chance of getting punished by your cat for forgetting to clean a box frequently enough. Everything I described above happens exactly as billed. And even our dumb neurotic brother-and-sister act somehow figured out how to use it very early on. They weren't even intimidated by the swirling Sarlacc pit that it becomes during cleaning. My key initial fear turned out to be totally baseless. So why does the thing make me yearn for the days of the scoopable Arm & Hammer, even though PetNovations Ltd says there are 82,940 households already enjoying this contraption? When I first watched the cleaning cycle, with my gadget-lover's grin, I marveled at the swirling and churning and slooshing and clacking. I kept marveling for about 15 minutes, by which time my grin had soured, and I was looking at my watch. By minute 25 I stormed out of the bathroom in annoyance, came back at minute 35, shocked that the thing was still doing its business, and then returned again, sometime after it had stopped, roughly 40 minutes after it had begun. CatGenie recommends that for two cats, the process should run two to three times a day. That's two solid hours of cleaning cycle. The installation is stupid simple, but you need to be within 8 feet of both a power jack and a toilet (or laundry water line and drain). If you think that's easy, stick your head in the bathroom—very few have power jacks anywhere near toilets, and I had to run my power cord up along the back of a sink. It's not a hazard, but it looks like Wilson's Amateur Home Improvement Show down there. CatGenie is also massive. Its basin has about half the volume our cats are used to, but because of its wide surrounding lip and the tower of machinery, the system is probably 25% larger than a good-sized plastic litter box. After a few days, we discovered an interesting characteristic of the non-toxic litter beads: They do not absorb odors. Right around 8:30 every morning, our big male cat, Wade, comes trotting up the stairs with a combination guilty/relieved look on his face, and soon after, we are engulfed in a sickening stink. Mind you, the cats' depository is an entire floor away down the stairs in the guest bathroom. 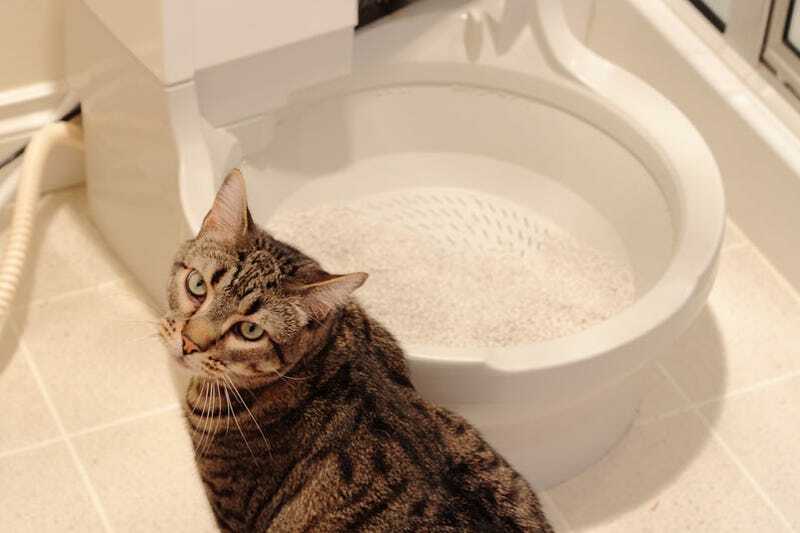 Scooping the offending dung into the toilet would defeat the purpose of owning a robotic litter box. ("Never touch litter again," they promised.) My sole move is to, yep, run the damn machine. Only the problem doesn't go away instantly. In fact, it gets worse before it gets better. As the detergent floods the basin containing Wade's leavings, the whole thing becomes a savory poop stew. Even when we run the fan in the bathroom, the smell is unbearable for about 10 minutes, after which it disappears instantly, replaced by the machine's pleasant perfume. I kept telling myself that these problems are just growing pains, things to get accustomed to. CatGenie is not as messy as a litter box. There's none of that residual ammonia smell that you can't get rid of permanently, and for the most part, none of the crusty extras that come from overzealous (or just misguided) burying. The plastic beads manage to find their way all over the house, and I am embarrassed to confess, our 1.5-year-old kid manages to stick one in her mouth about every two weeks, but they are non-toxic plastic beads after all, and nothing that can't be vacuumed up. At least, I once told myself, there are no more plastic bags full of poop and urea headed out to some landfill. I read somewhere once that San Francisco had solved something like 90% of its trash problems, and that the remaining 10% was cat and dog poop in plastic bags. (Not the actual stats, btw.) At least by switching to a bagless litter system like this, I'm being environmentally kosher, right? During every cleaning cycle, CatGenie runs a built-in hair dryer over all the beads for about 20 minutes. I plugged in my Kill-a-Watt meter and discovered this demanded a constant and alarming 1160 watts of electricity. For up to an hour per day, I am running the equivalent of four large plasma TVs, just so I don't have to touch litter. The costs start to mount. Besides the up-front $300 and the daily running of water and electricity, the $15 cartridge needs to be replaced every 60 cycles—that is, every 20 to 30 days. And the scatter-prone beads need to be replenished every three to six months, at $24 per carton. Like an inkjet printer, the maintenance costs continue forever, making the notion of buying a $7 box of Arm & Hammer every two weeks seem all the more reasonable. Despite all these negatives, a great debate rages in my household: I would like to return to the olden ways of scoop and bag, and my wife says, "No." Her argument, a good one, is that the bathroom has never stayed cleaner. Guests have to step around an awfully large contraption, but at least "it doesn't feel like you're walking into a barn."